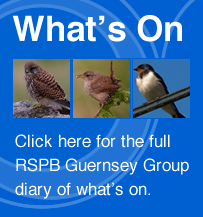 RSPB Guernsey | Working for a healthy environment rich in birds and wildlife. The Royal Society for the Protection of Birds (RSPB) is a registered charity (number 207076) and was founded in 1889. The RSPB is the country’s largest nature conservation charity, inspiring everyone to give nature a home. Together with our partners, we protect threatened birds and wildlife so our towns, coast and countryside will teem with life once again. We also play a leading role in a worldwide partnership of nature conservation organisations. The RSPB owns, leases or manages more than 140 nature reserves, covering a total of over 240,000 acres. The RSPB is a member of BirdLife International, a partnership of conservation organisations working to give nature a home around the world. The RSPB works for a healthy environment rich in birds and wildlife; it depends on the support and generosity of others to make a difference. By becoming a member of the RSPB you help to protect the future of wild birds and the environment. This website does not collect any analytical or browsing data.